In the second half of 2015, we participated in the Go Grow Programme at CSE. And by we, I mean the two co-founders and three interns, which was what made up CanopyLAB. At the time, we had only just began our journey and were still a bit puzzled with everything. Looking back, it seems a long time ago that we were learning about the different business models, learned how to write a business plan, and practiced how to pitch our idea to potential clients and investors. CanopyLAB was an eLearning platform for youth then. Now, in the beginning of 2017, CanopyLAB has evolved into an EdTech company, solving some of the biggest business challenges for leading corporations in Denmark through our innovative learning software. However, we still run the open learning platform student.canopylab.com, which was where it all began. And to understand just how much has happened since we started out, let’s start there — at the beginning. 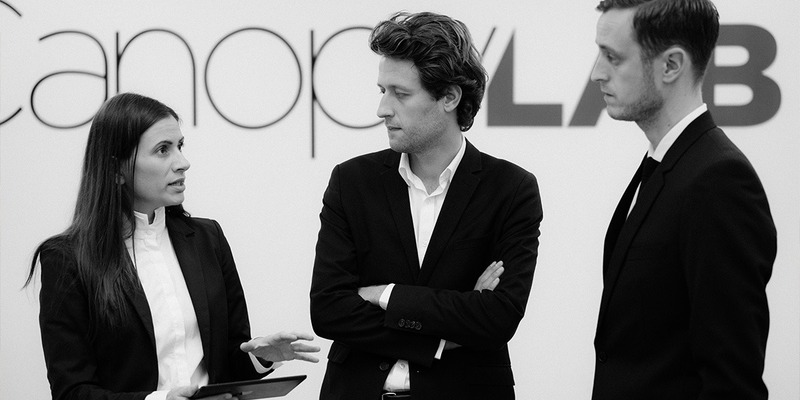 CanopyLAB was founded in August 2015 by Sahra-Josephine Hjorth, CEO and PhD Fellow at Aalborg University and Christian Skræm Juul Jensen, CTO and designer. The idea to create an online learning platform for youth around the world emerged in Australia, where Sahra-Josephine was teaching online herself as part of a research stay. She became interested in how social media can be used to create engaging learning experiences and empower youth through a strong online community. Realizing that no such thing existed, she decided to create an online platform herself. A burgeoning talent within her field of academia, it was not in the cards that her career would lie outside the walls of university. However, she wanted to make a visible impact and empower a generation through a new kind of learning. She asked Christian if he was able to translate what she envisioned into a learning platform and a social network. Within a week, Christian has designed and built what was the first version of CanopyLAB. The following year, the two of them tested and improved the platform, which grew rapidly. Users from all over the world were taking courses, learning about humanities and social sciences, gaining new skills and competencies, and building friendships. During this period, they learned more about what works and what doesn’t in an online learning space. Something that is vastly different from the physical learning environment that most of us are formed by. You can say that they came up with the recipe for what an online course should look like. The most important thing, however, is the underlying understanding that we’re all different and as a result, we all learn in different ways. This is why learning in an online space must be personalized and adaptive to enhance the learning for all. In the meantime, CanopyLAB had not only grown bigger as a team, in terms users, and markets, they had also attracted attention from some of the leading corporations in Denmark and the Nordics. Corporations, which were facing new challenges for their business, such as onboarding the most talented new employees, retaining the brightest and most hard-working, and creating an environment that motivates to continuous growth and development. Sahra-Josephine recalls how she multiple times were asked by leaders representing larger corporations why CanopyLAB’s learning experiences exclusively were available for youth. And she realized that it shouldn’t be — that the need for personalized and adaptive learning experiences among larger corporations is huge. Many of these corporations are facing challenges hiring and recruiting new employees and successfully securing that they are integrated into the company and deliver at their best. At the same time, employees have a need for constant learning to keep up with the rapid developments on the labor market. They need to acquire new skills and competencies and qualifications as a result of market-related technological developments, and require opportunities for personal growth and fast professional development that matches their ambition level. As a result, CanopyLAB has developed a new learning software, which is launched in the coming week, that helps corporations solve these challenges through an innovative use of new technologies, such as algorithms, big data, and gamification coupled with a social network. The software allows corporations to create engaging learning experiences that suits the individual employee, while learning about the needs of their employees, both through data and direct feedback loops. And employees, they get the opportunity gain new competencies and skills, while being part of a community of like-minded and creating a network, which is both motivating in the learning situation and helpful for their career path. At the time CanopyLAB participated in the Go Grow Programme, it’s fair to say they were a startup learning the game. Today, at the launch of their new software, which is already being used by some of the leading corporations, CanopyLAB has turned into a successful company with 11 employees, backed by a group of committed investors, still led by the same two founders, who are chasing the dream of making quality learning available for all. Let me end by making an aside. I was one of the three interns. Afterwards, I got a permanent job, continuing to be part of this amazing journey.